Ÿ UNISON news release and A Day in The Life of Social Work report. UNISON’s legal battle to give people at work the right to access justice – without having to pay unaffordable fees – when employers break the law went to the Supreme Court this week. The two-day hearing was the final stage of UNISON’s legal campaign against employment tribunal fees, introduced four years ago. Since July 2013, anyone who has been treated unlawfully or unfairly by their employer, and who wants to challenge them at an employment tribunal, has had to fork out a fee, which ranges from £390 to as much as £1,200. Workers challenging victimisation for raising safety concerns fall into the highest priced bracket. UNISON said the latest round in its legal challenge comes after the government produced its long-awaited review of the impact of fees in January. This showed there had been a 70 per cent drop in the number of cases since July 2013. Low-paid women, especially those treated unfairly when they were pregnant or on maternity leave, were the biggest losers. UNISON’s case to the Supreme Court asserted that the government’s decision to demand a fee from anyone taking their employer to court has stopped many thousands of badly treated employees – especially those on low incomes – from getting justice. UNISON general secretary Dave Prentis said: “If an employer breaks the law and treats one of their employees unfairly, they should be challenged. It cannot be right that unscrupulous bosses are escaping punishment because people simply don’t have the money to pursue a case.” He added: “Bad employers are having a field day, safe in the knowledge that few will be able to afford to challenge them at a tribunal. The government originally said making people pay would weed out vexatious claims. All it’s done is penalise lower paid employees with genuine grievances. That’s why it’s so important our legal challenge succeeds.” UNISON said it believed it would be about six weeks before a ruling was made. Supermarket security staff on the look-out for shoplifters one day could be guarding Britain’s nuclear deterrent the next, Unite has warned. The union said it is concerned that the proposed privatisation of the Ministry of Defence Guard Service (MGS) will lead to a drop in standards and training, with adverse repercussions for the security of sensitive sites. The MGS employs more than 2,000 guards providing unarmed security for more than 100 Ministry of Defence (MoD) sites, including the MoD main building in Whitehall and the naval bases at Portsmouth and Devonport. Unite national officer Mike McCartney said: “The UK government is planning to open up the MGS, whose personnel are well-trained, to privatisation. Unite wholeheartedly opposes these plans and considers any such proposals are irrational and dangerous to the security not only of MoD sites, but to the security of our service personnel, their families and to all the civilians employed across these sites.” He added: “If these proposals went ahead we could see someone deterring shoplifters at a supermarket on a Sunday then that same person turning up to guard a nuclear site on Monday. Employment conditions, training and standards could be compromised in ‘a race to the bottom’ by a private company keen to maximise profit.” The union said that private security companies would be required to bid under a system based 70 per cent on price and only 30 per cent on quality. Ÿ Unite news release. Morning Star. The National. Ÿ Unite news report. BBC News Online. 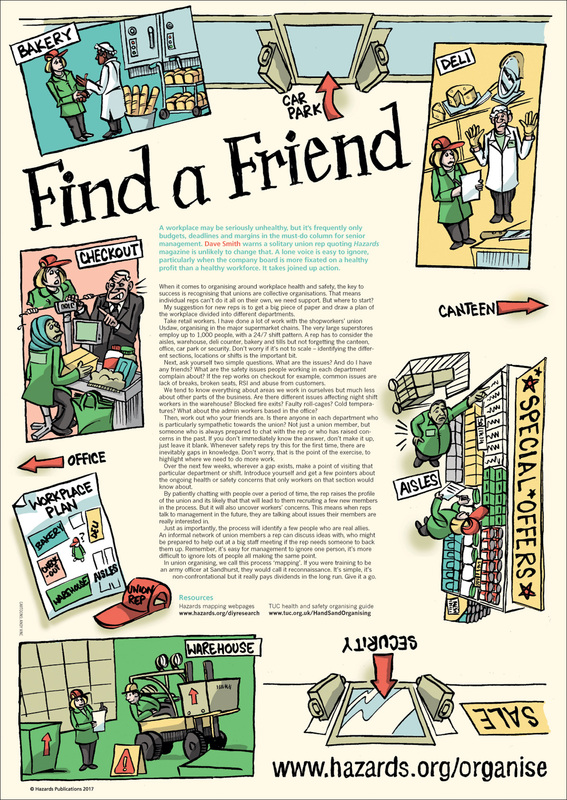 Ÿ Find a friend, Hazards 137, March 2017 and Dave Smith’s guide to organising around safety. TUC health and safety organising guide. Register for TUC eNotes on health and safety organising and other health and safety topics. A worker who killed himself had been badly affected by a succession of safety issues at work, an inquest has heard, including an industrial fatality, demotion over a safety breach, a fear of losing his job and personal disputes in the workplace. Jeffrey Taylor, 55, was ruled to have taken his own life as a result of five contributing factors which were said to have been weighing heavily on his mind. He had also been affected by two family bereavements and a dispute over a will. The inquest, held at Barrow Town Hall, heard one of the key factors related to an incident in 2007, at tissue maker Kimberly-Clark where he worked, when a colleague was killed by an unguarded toilet roll cutting machine. Kimberly-Clark was fined £180,000 in December 2011 as a result of the tragedy which killed Christopher Massey, with the 28-year-old deemed to have had insufficient training in using the equipment (Risks 537). In the months that followed the tragedy, Mr Taylor was demoted due to a health and safety breach and for six months was afraid he would lose his job. It was around this time when he first started taking the anti-depressant sertraline – the only substance found in his body when he hanged himself on 3 June 2016. Ruling that the death was suicide, coroner Paul O'Donnell said: “This was not simply a cry for help and Jeff intended the consequences of his actions.” Last week the TUC warned the UK is turning a blind eye to work-related suicide (Risks 793). The union body was speaking out after a series of reports highlighting how work factors can put large sections of the workforce at a greatly increased suicide risk, but the problem is not on the radar of the safety regulator. A report in Hazards magazine revealed that a broad-range of factors can be behind work-related suicides, including stress, harrowing or traumatic work experiences, oppressive management practices, job insecurity, overwork, toxic chemical exposures and occupational injuries, disability and diseases. Ÿ North West Evening Mail. 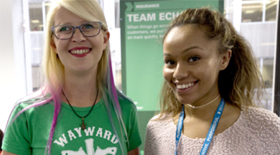 TUC guidebook on mental health in the workplace (registration required). Suicidal work: Work-related suicides go uncounted and unaccounted for in the UK, Hazards magazine, number 137, 2017. Hazards quick guide to work-related factors linked to suicide. Whirlpool UK Appliances Limited has been fined after a self-employed contractor fell from a mobile elevated work platform (MEWP) and later died from his injuries. The contractor had been working at a height of nearly five metres installing revised fire detection equipment, at the site of the former Indesit factory in Yate, near Bristol. At the same time Whirlpool UK maintenance workers started an overhead conveyor, unaware that the contractor was working nearby. The movement caused the work platform to tip over and the 66-year-old man fell to the factory floor. He later died from his injuries. A Health and Safety Executive (HSE) investigation found there was no effective control or supervision in place to prevent the conflicting work tasks from being undertaken at the same time. Whirlpool UK Appliances Limited pleaded guilty at Bristol Crown Court to a criminal safety offence and was fined £700,000 and ordered to pay costs of £11,466. HSE inspector Matt Tyler commented: “This is a tragic case where the incident could have been prevented if the company had planned and controlled the work properly.” In September 2016, a contractor worker at Whirlpool’s plant in Marion, Ohio, died in a fall from a crane. The company is a US multinational. Both contractor deaths occurred in plants making dryers. Ÿ HSE news release. Construction Enquirer. Marion Star. A major construction firm has been fined £800,000 after a worker was crushed to death by a dumper truck driven by his brother. Robert Paul Griffiths’ foot became stuck between the truck's brake and accelerator as he tried to move a broken-down scissor lift on a service road at Heathrow Airport while working for Laing O'Rourke on 2 October 2014. The truck reversed and crushed Mr Griffiths' brother Philip, 38, who was standing between the two vehicles. He was pronounced dead at the scene. An investigation by the Health and Safety Executive (HSE) found neither worker had the appropriate certificate to use the dumper truck and the operation was not properly overseen or managed. Laing O’Rourke Construction Limited pleaded guilty to a criminal breach of the construction management regulations and was fined £800,000 and ordered to pay £10,000 in costs. Speaking after sentencing at Southwark Crown Court, HSE inspector Jack Wilby said: “This incident was a tragedy for all concerned and, as revealed by our investigation, entirely avoidable. Laing O’Rourke did nothing to address the trend of these workers carrying out tasks they weren’t trained or authorised for. These dedicated staff, including Philip and his brother, needed appropriate supervision.” He added: “Had there been appropriate supervision, then better segregation between Philip and these two vehicles could have been established and maintained.” Robert Griffiths said his brother’s death had “devastated” the whole family. “My whole life changed for the worst on 2 October 2014 and will never be the same again,” he said. Ÿ HSE news release. Your Local Guardian. Construction Enquirer. Evening Standard. Ÿ HSE news release.Hazards Campaign conference webpage, blog and booking form. Precarious work is bad for both mental and physical health, according to a new survey of nearly 5,000 workers by the Ontario Federation of Labour (OFL). The union body, which represents workers in Canada’s most populous province, found almost one-third of survey respondents cite mental and physical health issues as impacts of precarious work. OFL said its survey results underscore the case for modernising Ontario’s ‘woefully out of date’ employment laws. “We need to consider the whole picture when it comes to employment, instead of just businesses’ bottom line,” said OFL president Chris Buckley. “I think that’s what business critics are missing, when we talk about changing the employment laws to make improvements for workers. Precarious work makes people sick – period.” OFL said its ‘Make it fair’ campaign takes on issues of inequality in the workforce, and coincides with the provincial government’s Changing Workplaces Review. The campaign is seeking across-the-board changes to Ontario’s Employment Standards Act and Labour Relations Act that would improve standards for every worker and make it easier for them to join a union. Ÿ OFL news release and Make it fair campaign. Toronto Star. More on job insecurity and health. Ÿ IUF news release. ECHA news release. Laura N Vandenberg and others. Is it time to reassess current safety standards for glyphosate-based herbicides?, Journal of Epidemiology & Community Health, published Online First: 20 March 2017. JECH news release. Sign the European Citizens' Initiative petition seeking a ban on glyphosate. IARC question and answer on glyphosate. Unions should take action to stop the asbestos industry once again ‘sabotaging’ efforts to better control its toxic exports, the global union for the construction sector has said. BWI was speaking out ahead of a crucial conference to update the UN’s Rotterdam Convention list of especially hazardous substances subject to ‘prior informed consent’ (PIC) health warnings when they are exported. Past conferences, which take place every two years, have seen the blocking of every attempt to get chrysotile asbestos – the only form currently in production – added to the PIC list, after extensive lobbying by the industry. A requirement for consensus – which is being challenged at this conference - means the asbestos lobby only has to enlist the support of one government to block the proposed listing. The latest conference, to take place in Geneva from 24 April to 5 May, will see government representatives from 160 countries gather to discuss which hazardous substances should be listed. It will be the sixth time the conference will hear a UN recommendation that chrysotile asbestos be added to the PIC list. “Chrysotile meets all the criteria for inclusion,” said Ambet Yuson, BWI’s general secretary, “so it is outrageous that this is being blatantly and persistently blocked by asbestos exporting countries. We need all governments to push the exporting nations to behave responsibly, and to recognise that this Convention is fundamentally flawed.” He added the requirement for unanimity should be removed “in order to put an end to this farcical situation, which completely undermines the credibility of this important international convention.” Global union IndustriALL and international trade union confederation ITUC have also urged their affiliated unions to press for a change to the voting system, backing a proposal by a group of African nations. The recommends a switch to the 75 per cent approval system that exists already for the two other UN treaties dealing with hazardous substances and exports, the Basel and Stockholm conventions. Ÿ ITUC news release. ILO Governing Body decision. Inside World Football. Doha News. TUC Playfair Qatar campaign.